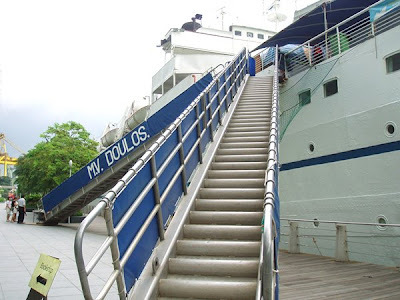 I decided to visit the MV Doulos, the world's oldest active ocean-faring passenger ship and largest floating bookshop, while they were stopping over in Singapore for a few days! The day was cloudy, warm and humid. 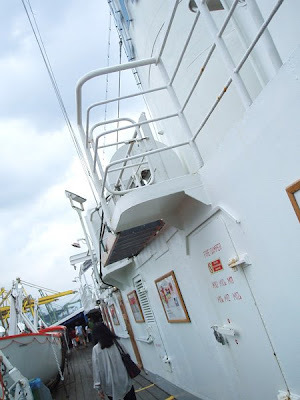 MV Doulos is an evangelical-based, non-profit organisation, and none of the crew on board is paid a salary. They stop around the world at ports of call. Of course I had to bring my camera along and here are some snapshots. 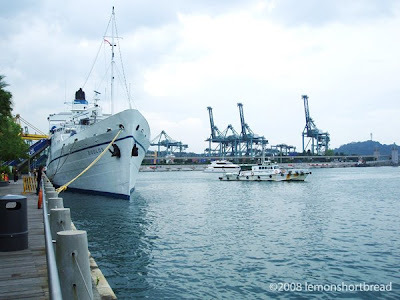 Doulos' frontal view docked at Vivo berth outside Vivocity, Singapore's largest mall complex... convenient! The Star Wars-like structure at the background are the cranes for the containers at the Keppel Harbour. These are the only ways up and down. They aren't exactly stairs, I had a hard time climbing those as they aren't edged steps; more like round metal trunks to ballet all the way up. It's high, it's slippery and I shouldn't have worn flip flops..
After the climbing ordeal, this is the deck towards the bookshop. 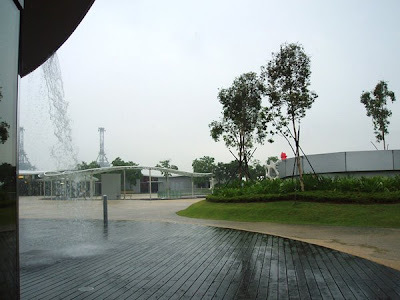 This is Vivocity outdoors; it poured heavily after we came off the ship and while walking through the shelter to get to the other side, we came across this 'waterfall canopy' blocking our way. Someone should really redesign the sheltered walkway. Either you head out in the rain make a big circle to avoid it, or you make a mad dash across the waterfall (which we did with an umbrella but still got wet). I can't imagine how the 2 foreign businessmen we passed not get their expensive suits wet. Thats an amazing thing having a ship as a bookstore. Its great also that the workers are all volunteers but I probably would be if I got to see many corners of the world which you wouldn't normally get to do as it would cost way more. How cool is that! 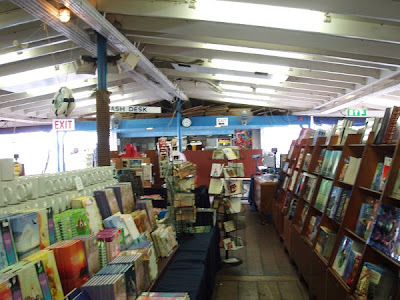 A bookstore on an old ship. Glad you didn't slip on the stairs. Wow!! A bookshop on a ship is my idea of a dream-come-true! Now if they had a coffee shop in there, too.....I'd be in heaven. Thank you for sharing this with us! That is so interesting..the bookstore is really big too..Great pictures..I would not like to climb those stairs with flip flops..you were very brave..ha, ha.